Tail of the Horseshoe Lightship – Chesapeake Chapter U.S.L.H.S. Located on the lower Chesapeake Bay 3.4 miles and 331 degrees from Cape Henry, Virginia. From sometime in 1900 until June 22, 1901 the station was served by LV71. LV71 was primarily used on Diamond Shoal in North Carolina. It was built in 1897 by Bath Iron Works, Ltd in Bath, Maine. While on station at Tail of the Horseshoe, the lightship displayed oil lights. LV46 replaced LV in 1901 after being transferred to the 5th District. It served on Tail of the Horseshoe until 1922 when the station was discontinued. 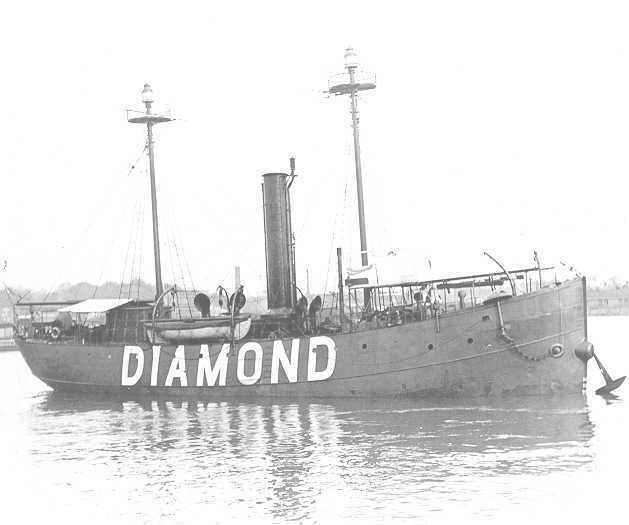 Photo is of LV71 in 1917 while on station at Diamond Shoal. U.S. Coast Guard photo.